Every element of this enchanting bangle reflects the iconic luxury and handcrafted couture of the Neil Lane brand. 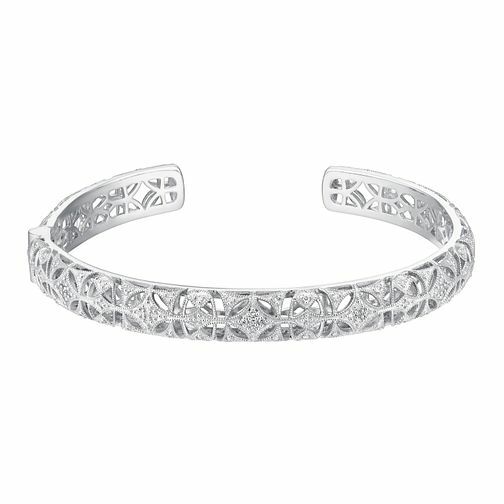 Featuring an intricate cut out design and diamonds totalling 31pts, this beautiful sterling silver open bangle is the perfect addition to her jewellery box. Neil Lane Designs Sterling Silver 0.31ct Diamond Bangle is rated 4.3 out of 5 by 7. Rated 5 out of 5 by Anonymous from Lovely Lovely. Got the matching earrings and necklace. Was worried that it would be too large for my small wrists, but this has some adjustability to it and was perfect! Rated 5 out of 5 by Anonymous from Very beautiful Bought this over Christmas at EJ Dundrum Store- absolutely beautiful and eye catching piece but was so surprised & disappointed to see the box that it came in ! There should have been a little space which can hold the bangle in the place instead it's going all over the box as it can easily fall out of the box when opening if not careful enough !